After a long day of long deliberation, long discussion and longer cups of coffee, a lot of shopping which left me feeling guilty and compromised, and having missed the Firefl ies festival (Wikipedia and an older review), we decided we could hold more discussions with a bottle of wine. And thus, we walked into a shop on MG Road, and in a fateful moment, we decided to go for Cabernet-Shiraz from the vineyards of Grover, very near Bangalore. 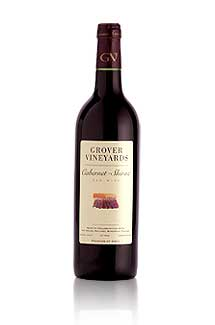 In fact, it was the geographical proximity that clinched the deal for Grover, blessed be his wine! Once at home, the setting had to be perfect, and nothing better than Lord of the Rings: The Fellowship of the Ring to see some cool and calm action. Now, the setting was perfect, and after biting a few nibbles, we were ready for the celebration. Drumrolls… the wine bottle was opened, and Murphy couldn’t desert me just like every other time, and he came in the form of a cork. Sula‘s are better — the bottles don’t have cork, but now we were stuck at home at 11 in the night, with a bottle of wine but no cork-opener. And no Swiss Army knife. And two guys really really desperate to have the wine. Not a pretty sight. Never learnt to accept defeat, did we? All our engineering prowess had to come to use now. The cork would be subjected to a number of implements over the next hour without respite, until it yielded to our superior knowledge of stress, tension and torque. The first up was the common fork, spotless and stainless, benign usually, but a mighty force in the hands of a master. The fork was sharply thrust into the cork, and as we flexed our biceps in applying the torque, there was a loud clank and we thought the cork had popped. But no, the cork was stronger than we expected, and it was the fork that had clanked. Far stronger than expected — it was smartly using all the vacuum inside the bottle to bolster its position, and putting up a seemingly winning fight. We almost accepted defeat, but suddenly, we were reminded of our machine tools class, and all the filing and minute working of the lathe we had practiced. A frantic search started in the house — something sharp and long. And thus, a lot of search found us our next weapon for our next battle. A small pair of scissors, innocuous but intense, and after a few rounds of sharpening it on the granite (like a true expert! ), we again thrust it into the cork. The cork seemed to open it mouth, and engulfed the scissor’s blade. A whale gulping down the missiles we fired at it. And we would have none of it. More throwing of pots and pans around, cleaning up our messy kitchen, moving heaven and earth, and we found the knife we had gotten free with our stove-lighter. Not a Rampuri, but baleful and unrelenting, the knife was the perfect tool for our fresh attack. The bottle was held tight with both hands and the knife thrust in it. After it refused to go in further, it was hammered in further with all the pots and pans we had cleaned up. The knife was turned, and yes(! ), the cork unscrewed as well. Success is tasty, and wine is tempting, and we continued with the attack. The cork started giving in finally, but brittle as it was, it broke, and we had to cut parts of it off, and repeat the process. Finally, as it seemed to be succumbing, we upped the effort, and in one giant pop something happened. Wine was all over us. The glass of the bottle had broken off from the side, and some of the wine had spilled all over the kitchen. Thankfully, damage had been limited to the wine bottle, and not to our hands or the kitchen. But yes, we had won! We had finally prevailed over the corky and cranky enemy. Wine was ours to be had. And what better way to celebrate than a bottle of Wine. Cheers!